I've been trying to write a post for sometime and each time I am facing a blank.Looking at the pics is not helping either as I am transported back home where amma is frying up those chips for me and we sitting in the veranda,with a cup of chai and chips enjoying the rain outside! 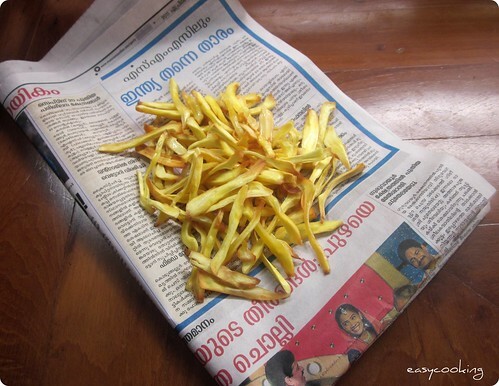 Amma made this for us when we were in Ernakulam for a short visit sometime back.Our dear neighbor gave a small piece of jackfruit from her 'parambu'[compound]and within minutes amma got this chips ready. Oil your hands and cut the fruit into half. 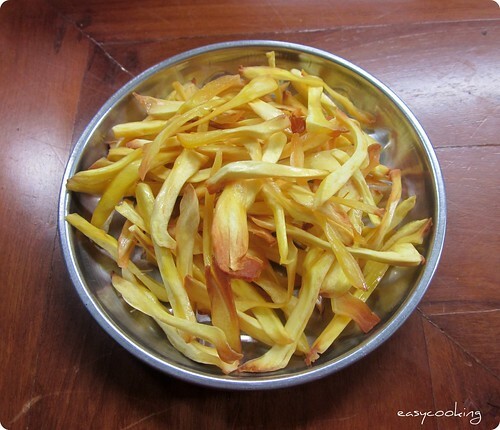 Remove whole jackfruit bulbs and deseed them. Chop the whole bulbs as thin as possible into long slices[just as you would for french fries]. In a thick bottomed kadai heat oil for deep frying. Mix together salt and water,keep aside. When the oil is smoking hot,tip in the sliced jackfruit and stir once till they are evenly placed.Add just enough for the amount of oil and do not crowd them. Add 1-2 tsp of the salt solution to the oil--at this point the whole mix would bubble up. Stir once in a while so that the heat is evenly distributed. Keep the flame on high and let the chips become golden brown and crispy. Drain into a colander,let it cool and then store in airtight containers. Do you need my address Divya? This sounds very interesting. Never tasted it before. Nice recipe... YUM! lovely and tempting crispy jack fruit chips my hot favourite. I once bought this from store and liked it,never knew its so easy to make! Drooling! Have always bought these from the store, never attempted making these chips at home. Cutting the jackfruit needs some amount of practice I guess..Shall try to be brave and attempt sometime:-) Thanks for the recipe! Hmm.. my fav. I love them a lot. My mom makes this often when I am there. Very nostalgic. Those sound delicious...a really nice snack! The chips look awesome.Do you think its possible to make chips like this with frozen jack fruit. Havent tried jackfruit chips but this sure looks delicious. I love these :D Its been some time that I had them..
Divya i always wait for summe to have this delicasy all three months..
Divya nothing can beat amma's tatse nave divya??? I have had jackfruit chips earlier, but never realised they were made out of the bulbs! I always assumed its the white jackfruit flesh (used in curries). Do the bulbs have to be raw? Usually the bulbs are a ripe yellow and are very sweet... so I guess those won't do, right? OMG! The pic is so tempting... I love these , I could finish 1-2 packets of this in one go... How I wish I could get some homemade chakka varuthathu now, sigh! Looks perfect!!!!!! but 1Q - wht is "Ponsa Karo"? havent heard tht b4..